Pushing through a declining enthusiasm for reviewing the so-called 'LT' routes, the London Bus Breh catches up with all the conversions of 2016 and into 2017. 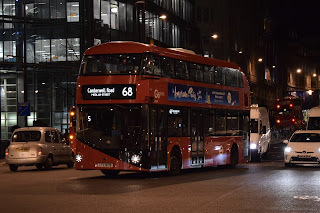 The first 'New Routemaster' conversion of 2016 was with the retaining of route 68 by Go-Ahead London: London General from Camberwell (Q) on 6 February. This allowed a standardised allocation for a route which previously pick-and-mixed between recently transferred Enviro400s and older Wright-Volvos in fleet. LT664-690 were introduced on time, but then merely demonstrated the slow introduction of new buses to retained routes now common to the London bus scene. Holborn Circus. The route otherwise runs from Euston to West Norwood. I was not particularly impressed with Camberwell Bus Garage's first LT convert route 12 in 2015, but the 68 was a slight improvement. Only because I find it a better route to tolerate the generally panned bus type and my driver was fast. The driver began the fun along Kingsway, racing towards the already green traffic lights at the end of the Aldwych approach. A brief elevatory glide upon uneven surface showcased the positive trait of LTs in their absorption of rough feedback. Acceleration was nevertheless undettered by this moment, the driver determined to beat the lights albeit braking having to swiftly follow to complete the turn into Aldwych. Closing in on the green traffic lights, the driver accelerating ever closer to them, racing ever closer into the braking zone, the traffic lights abruptly cut his eagerness short and restored full sensibility to the drive as the bus was called to a halt. Anticipating records to be broken, I patiently waited for us to enter Waterloo Bridge Road as the driver circumnavigated Aldwych, in the meantime quickly fetching for my speedometer app to occupy my impatience an ounce further. However, the road made one-lane by the cyclist lane on the approach to Waterloo Bridge meant that the driver had to follow the moderated speeds of traffic ahead, so by the time the road opened up on the bridge we could only use the momentum of the moderate speed to achieve 36mph, denying the opportunity to record my first 40mph+ aboard a 'New Routemaster' courtesy of finally boarding one with a driver displaying the rare potential to meet this target. Waterloo and Elephant & Castle were unlikely to provide another opportunity for this, so instead I started paying more attention to the hybrid system's performance. Diesel and electric modes roughly shared equal times in operation, albeit in the unsurprisingly sporadic fashion of LTs in general. The long roads towards Camberwell and the rest of route 68 to West Norwood might have allowed us to go faster than along Waterloo Bridge, however I applied self-discipline and got off at Elephant to follow my schedule on other 'New Routemaster' routes. Route 68 is one of the better LT routes we have, but the section that I tried out is only a parallel of route 168 so, in that respect, I cannot single it out as a recommended 'New Routemaster' service. 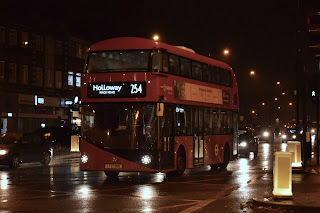 Also on 6 February 2016, Metroline retained route 91 from Holloway (HT) with new 'New Routemaster' hybrid buses. The garage runs the most controversial LT route 24 and also run route 390, which was a pretty banal conversion to follow. Therefore, the postponement of LT745-766, plus ST812 - the only shorter 'New Routemaster' in service - until May might have been a positive for route 91 to prolong its use of existing Enviro400s ... "conventional" buses. Route 91 runs from Trafalgar Square to Crouch End. However, I was pretty pleased with the performance of this batch of LTs, which were gradually phased into service from 9 May onwards. But firstly on ST812. Two chairs removed on the bottom deck behind the wheelchair area was the only noticeable difference between the ST and the LTs. No other differences in length and performance were clearly evident and seeing as orders for the 'New Routemaster' integral have stopped, companies outside of London who have (made the mistake of) trialling the buses have not showed further interest in purchasing their own batches. Furthermore, with the Volvo B5LH dominating yet another integral chassis (more on that later), ST812 has little purpose other than to merely add discrete differentiation within a fleet of imitations which vary little themselves except for the different routes they serve and the logos of their respective operators. End of rant. 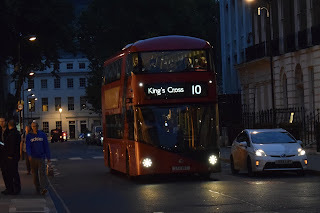 The sole ST and the LT I caught on route 91 seemed to have adequately performing hybrid systems and the ride quality of both buses were decent, although hills have never been a favourite for the 'New Routemaster' as exhibited courtesy of Hornsey Rise. With the exception of LT758, then, whose engine seemed to be overheating from the slight burning smell I was met with upon boarding, the driver almost immediately then telling us to get off, route 91 has quite a decent batch of 'New Routemasters': considering it is an LT route from Holloway. Therefore, except for maybe yet another batch of Metroline VWHs, I cannot really imagine what else would suit the 91. Route 3/N3 was one of quite a few service changes during 2016 to not receive an official date to start introducing its 'New Routemasters' to service. 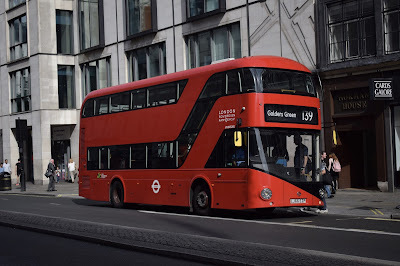 The first examples from batch LT691-715 were phased onto the route from 9 February, displacing Enviro400 hybrids to Walworth (WL) to fully hybridise route 381 against its previous batch of ageing Wright-bodied Volvo diesel buses. 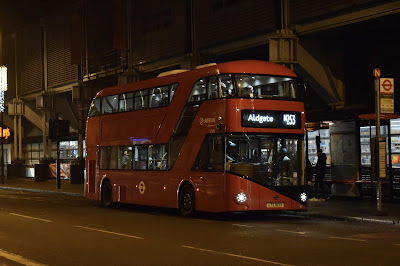 Route 3 became the second bus route from Battersea (QB) to be allocated LTs, following Abellio London's controversial win of the traditionally Arriva operated route 159 in December 2015.
from route 159, on route 3 in Brixton. 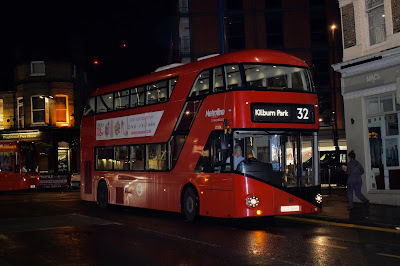 I had a thrilling experience of this service change a few months after the buses were introduced, but it was a rare night bus journey aboard an N3 that provides my review. The LTs may not be the best buses on our streets, however there is no denying that they have a certain sturdiness to them which enables their smooth dismissal of the roughest of road surfaces. Night buses are also known for their generally fast pace unmet by the average bus journey during the day, so there was no surprise in the driver accelerating over the speed bumps and through the narrow roads of Bromley effortlessly. What was more of a surprise was actually how fast he was able to get the 'New Routemaster' moving, the agility he was able to unleash, considering acceleration is another poor characteristic of the bus type. Perhaps the effective brakes, a better quality of the LTs, contributed to the impressive manoeuvrability of the drive. Nevertheless, the journey for which I had intuitively waited (having realised that I had stayed in Bromley later than planned but beneficially in terms of the first night bus in the area now being minutes away from starting service for a more direct route home) had immediately impressed. Growing accustomed to the unusually fast journey aboard the LT, I focused on my usual criterion and found that the bus did not seem to run in full electric mode at all, the engine humming noisily throughout most of the journey. In addition to this, I discovered the full potential of the 'New Routemaster' on hills, Anerley Hill the perfect course for this test with a fast driver to bring all the momentum needed to complete the course. The score? Below par. Uphill, the bus needs to have brought up significant momentum before climbing - which we sort of achieved (can't actually remember, but I would assume so considering the driver I had) - otherwise the top speed reduces to 18mph with any speed faster than this placing too much strain on the engine. While the acceleration declines ridiculously uphill, downhill is not only an obvious improvement but the bus is as agile yet also as sturdy as you could possibly want it to be to be in control of the descent whilst still setting good pace. The downhill performance was analysed at Dulwich Wood Park and on South Croxted Road, my experience of the 3 proving these sections to be the most exhilarating back when the route had its Alexander ALX400 bodied Dennis Trident 2s - what beasts those buses were! and also the service's driver changeover point mid-scroll. As the journey calmed down into familiar territory towards central London, I considered LT618's ambitious persuasions to invite the 'New Routemaster' into the league of the likes of Alexander Dennis' Enviro400H and Volvo's B5LH. However, as astoundingly fantastic as the ride from Bromley North to Piccadilly Circus was, it wasn't a representation of the performance of all LT-allocated bus services. However, I think that route N3 at least managed to exceed my fairly low expectations of the 'New Routemaster' at its full potential. Route 211 runs from Waterloo Station to Hammersmith. Prior to its new 'New Routemasters' entering service on 29 May 2016, route 211 did not really seem to have a focused allocation. Various early and more recently purchased E40Ds and E40Hs from Battersea (QB) used to represent route 211, but now new additions LT768-788 give uniformity to the service. There's not much to add about route 211. I had a brief ride aboard its new LTs from Victoria to Waterloo in the summer and the journey was fairly quiet and smooth. Another journey in December was quite the same around Chelsea, where diesel and electric modes were in operation and there was nothing to complain about. 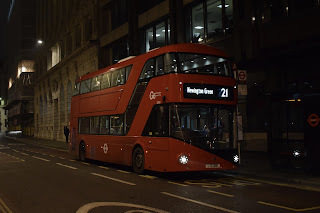 I think it is only fair to say that route 211 suits 'New Routemasters' and perhaps the uniformity welcomed by its conversion emphasises this simple conclusion. Arriva retained route 137 from Brixton (BN) with existing 'New Routemasters', LT317-351, on 17 September 2016. However, new buses LT954-983 were phased onto the route from late May 2017 to replace the original batch of LTs. This complies with Brixton being one of 12 'green' bus zones initiated by Mayor of London, Sadiq Khan, to improve London's air quality. The new batch meet Euro VI standard, so are more appropriate for route 137 with its initial batch moving to Ash Grove (AE) for the second-hand conversions of routes 48 and 254. No, I did not note down any significant difference between examples from LT317-351 and their Euro VI successors. A week later, Metroline retained route 16 from Cricklewood (W), the new contract demanding four more 'New Routemasters' alongside LT543-563 to restore the service's peak vehicle requirement to 22. These additional vehicles were subtly sourced from route 189, whose own contract renewal on the same weekend saw the route become the third LT route at Cricklewood. While the batches are intermixed between the routes based on availability, making it insignificant to identify by fleetcode the exact additional vehicles for the PVR increase, the two extra buses included in the new batch for route 189 enabled route 16 to restore its PVR. The issue with this service change was that surplus became even more scarce. LT543-563 initially catered for the ludicrous PVR drop from 22 to 18, meaning two buses could be made surplus from the batch. Upon contract renewal, the batch of 22 buses acquired for the retention of route 189 - two for the 16 - meant that only one bus was made surplus between the routes (route 189 was retained with a PVR of 19). Considering the frequent MOT checks and mechanical issues associated with the 'New Routemasters', this lack of surplus resulted in many TEHs returning to route 16 especially, reflecting LT shortages at the garage. Not that I should complain: the 16 with TEHs was a fantastic service. But even with their sporadic reappearances and despite the restored PVR, the service as a whole has not been restored to its high quality and reliability. Buses used to be frequent, with a bunching of two buses at one part of the route barely causing gaps elsewhere in the service. Now, it has just become more uneven. Route 16 runs from Cricklewood Bus Garage to Victoria. The quality of the service does not seem to have been restored with the PVR, especially since the LTs have nothing on the TEHs, but the transfer of the silver LT190 to Cricklewood on 13 March 2017 at least restores some speciality to route 16. LT789-811 were ordered with Metroline's contract renewal for route 189 on 8 October 2016. 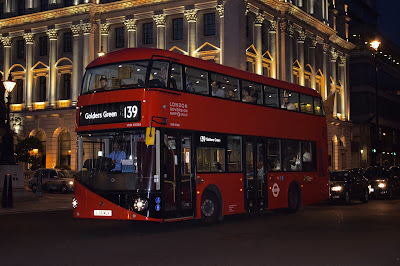 'New Routemasters' were phased into service from July 2016, but appearances were sporadic and were mostly from existing batches LT543-563 (for route 16) and LT643-663 (for route 168) with buses from its own batch more commonly in service on the other routes. Route 189 now runs from Brent Cross to Marble Arch. Lisson Grove to make way for renovations. I was not too impressed with Cricklewood introducing LTs to a third route, but the 189 pleasantly surprised me. I jumped on my local route and almost automatically embraced the luxurious atmosphere that the lighting of the saloon provides. I should be used to this by now, with the overabundant presence of 'New Routemasters' we have on our streets, but perhaps this shows how well-suited to the route the buses are. I felt I could quickly grow accustomed to LTs on the 189, unlike with route 16 where it all felt a bit weird to start off with. I was expecting North Cricklewood to expose the weakness of the LTs' acceleration since it is the fastest section of route 189, but I can't remember feeling much disappointment with the ride here. 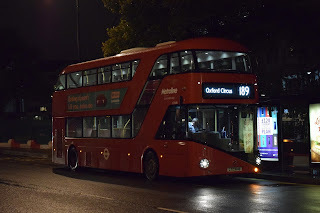 As of 1 April 2017, route 189 terminates at Marble Arch instead of Oxford Circus, however the N189 has been introduced to continue running to Oxford Circus nightly. During the day, route 113 replaces the 189 on John Prince's Street. 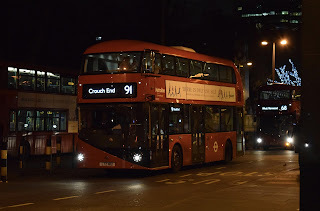 Some buses can be seen displaying the new 'N'-prefix blind style in its elevated position before the number '189' during the night service, however I have seen other buses simply displaying 189. It would be worth adding that the 189 has since reduced its PVR-1 to 18, so surplus should be a bit better now. I joke. Route N189 runs from Brent Cross to Oxford Circus. This photo was taken in December 2016, before the night route was introduced. 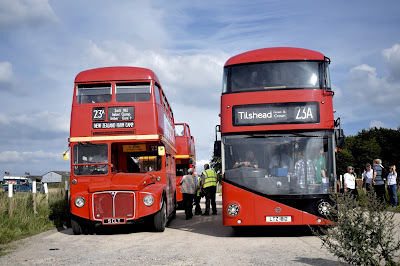 The 30th 'New Routemaster' convert, route 21, introduced New Cross (NX) to its first batch of LTs. A third 'New Routemaster' service change on 8 October 2016, then, Go-Ahead London: London Central retaining the 21 to add to the mix. With only nine LTs having entered service by the end of last year, the Gemini 2 bodied Volvo B9TLs previously allocated to the route were very slowly displaced as converting route 21 to a fully 'New Routemaster' service continued into 2017. Despite the slow conversion, LT845-874 deem to be worthy replacements, as my experience aboard LT849 and LT851 prove. Route 21 runs from Lewisham Shopping Centre to Newington Green. An interesting route, there was no prior incentive to pay attention to the 21 since its buses could be found on higher profile and, for me, more familiar routes from its garage. The knowledge of its termini had made me wonder how its routeing linked the southern settings of Lewisham to the residential surroundings of Newington, north London, as effectively one route. The new LTs provided my discovery. Paralleling route 436 from Lewisham to New Cross Gate, route 21 then switches its parallel with routes 53 and 453 onto Peckham Park Road and the Old Kent Road. Diverting the New Kent Road approach to Elephant & Castle by ducking right onto Bricklayers Arms, the route takes the first exit onto its own section leading to Borough and Bank Stations. Moorgate and Finsbury Square follow before the route is invited onto residential streets from Mildmay Park onwards before reaching its terminus at Newington Green. The route itself suits the luxurious lighting, and the smooth and sturdy driveline offered by the 'New Routemaster'. However, neither LTs I boarded seemed to run in electric at all, a reminder that these hybrid vehicles are not as "world-class" as once claimed. Not a letdown service change for route 21, though, which I regard as an enjoyable and very useful route. Hackney Central for Euston Station on route 253. Arriva London started allocating new batch LT813-844 to route 253 from 17 October 2016. Prior to their introduction, existing LTs from route 73 had been roaming about the route in small numbers. This service change has since ousted most of its former Wright Eclipse Gemini 2 bodied Volvo B5L hybrid buses from Stamford Hill (SF) to Brixton (BN) as Arriva continue to make more of their garages fully hybrid. Route 253 is another fast route, but I dozed off throughout most of the journey. The only thing I did notice was that the sporadic moments I spent awake during the ride was not met with electric drive. I insufficiently reviewed this batch of 'New Routemasters' to comment much on the service change and Arriva have generally introduced the best batches of LTs so I shall just leave this one with a photo of route N253 which has also fully converted to 'New Routemaster' operation. Route N253 runs from Tottenham Court Road to Aldgate Station. London Sovereign became the first operator to directly purchase a 'New Routemaster' in 2016. TfL had previously ordered all of our 1000 LTs themselves, with WrightBus focusing production of the type for London's bus services only (since nobody else be buying them). The Wright Group unveiling a two-door alternative with one staircase has allowed them to attract more customers whose specifications accept these more conventional features. Given the title WrightBus SRM, the RATP Group ordered six to be housed at Edgware (BT) for London Sovereign route 13. VHR45203-08 were very gradually phased into service from 19 October 2016, VHR45203 the first example which started service on Edgware's school routes before displaying its allocation to route 13 from November onwards. The last entry, VHR45207, was in January this year. Route N13 ran from Aldwych to North Finchley. A review on its withdrawal on 1 April 2017 coming soon. I managed to get a short ride aboard VHR45204 in late December on route N13. If I had adopted a nocturnal sleeping pattern beforehand I would have taken the bus all the way to North Finchley: the quality was superb! Night drivers are generally fast due to less traffic, but this driver was giving it his all along the less busy roads of central London nightlife which demanded the B5LH driveline to showcase its quality. 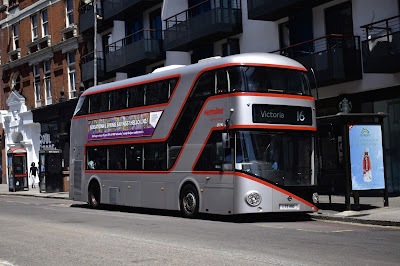 WrightBus expected the SRM to be slightly heavier than its highly successful Gemini 3, but the quality of the performance from the Volvo B5LH chassis was undiminished by the Routemaster-imitating bodywork it was carrying. I tend to want to experience at least one lengthy journey of a bus before establishing the foundations for reviewing it, but in a few stops my feelings had been energised into to a swift conclusion that the VHR had earned itself a place in my selective list of top three favourite double-deckers in London, a list I have found difficult to produce with the Alexander Dennis MMC vs. Wright Gemini 3 competition making up the majority of our double-decker bus fleet. The VHRs simply stand out, both in design and ride quality. I still stand by my view that the 'New Routemaster' is only an imitation of the iconic Routemaster, but the VHRs make 'imitation' sound a harsh word when they are high quality buses. WrightBus should have gone to Volvo and not VDL when developing the 'New Routemaster' as the 'New Routemaster' would have been more widely accepted from the start. 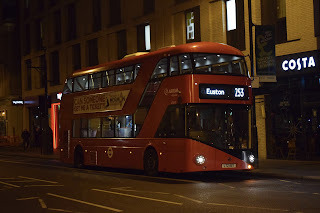 Early in the summer, I caught up with route 139 following the controversial service changes to routes in the Baker Street / Finchley Road corridor (article coming soon). Now at London Sovereign, the 139 sometimes has the odd VHR in service but the vehicles more frequently run on route 183. On one of these somewhat odd occasions, I took VHR45205. A few stops into the journey I realised that the WrightBus SRM had not been introduced with opening windows that many LTs had to go out of service to be retrofitted with last summer; the SRM had not yet been introduced into service then, so perhaps they could have sorted out this omission with the VHRs before they entered service last October. I did not notice the absent opening windows with the N13 because it was winter when I first caught the bus type, so the air-conditioning was not as demanded as it is for cooling down passengers in the summer. I'm slightly used to LTs having windows that open now, so this absent feature with VHR45205 annoyed me that extra bit more than it would have done in the past. I also did not notice until my journey aboard VHR45205 the rather new yet ridiculous omission of the rearview window at the bottom deck, BYD's electric buses starting this irritating theme. I do like the alignment of seats at the back of the upper deck, but WrightBus' trademark black paint at the rear-end means the rearview is blocked on the right side of the bus (see picture) which is another annoying characteristic of the bus. 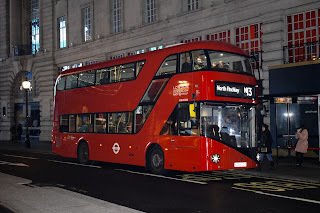 Other than these issues, though, the VHRs are still the best 'New Routemasters' that WrightBus have produced and are among the best double-decker buses in London, in my opinion. Route 10 now serves the British Museum and Russell Square. LT157 is pictured demonstrating the re-route on Montague Street. Transport for London have developed a reputation for indirectly solicited route changes especially over the last year, their direct objectives obscured under the phrase 'cost-efficiency'. Hints of it were demonstrated by infamously cutting back route 7 from Russell Square to Oxford Circus and then route 98 showing glimpses of becoming its replacement by terminating at Russell Square contrary to Holborn for a while. On 25 June 2016, the 98 was restored after a few spells at Russell Square, whereas route 10 became a permanent replacement for route 7 here. Continuing to terminate at King's Cross, route 10 now dives into Great Russell Street to serve the British Museum from Tottenham Court Road Station instead of Warren Street and Euston Square, running via Montague Street, Russell Square, Woburn Place, Tavistock Square and Upper Woburn Place before rejoining its former routing at Euston Station. Perhaps some independence has been bestowed upon a route which otherwise presents itself as second-best to the routes it parallels now that it has a section where it provides the only service. However, for my more local route 7, a route which has a great demand, history and presence west of Paddington, its cutback could signal the truth within the rumours that its withdrawal is imminent. Route 10 was retained by London United from Stamford Brook (V) with existing batch LT148-175, plus newer addition LT461, on 28 January 2017. However, this bus along with LT460 (from Shepherd's Bush Garage for route 148) have since transferred to Metroline - not a difficult task, just switch the logos. before moving to Brixton (BN) where it is now on routes 59 and 137. Arriva London started introducing 'New Routemasters' LT716-744 to route 59 from 22 March 2016, retaining the service and its buses on 28 January 2017. Indeed, they replaced the ludicrously poor VDL DB300s carrying Wright Gemini 2 bodywork. From my experience on the 319, which I would think is more of an obstacle to test the performance of a bus than the 59 given the variety of road types it tackles (hilly sections, long roads, many turns, etc. ), the power required to keep the DWs moving uphill was a strain for the engine - the revs were going mad as the bus tried to find more power - and the acceleration was just not impressive. This was further backed up by a 159 driver another day who did not hesitate to say she preferred the VLAs when I asked for her favourite bus type. As a central London route, the 59 looks like it suits Borismasters. However, after waiting so long to find the time to cover the change this summer I was completely disappointed by the experience. 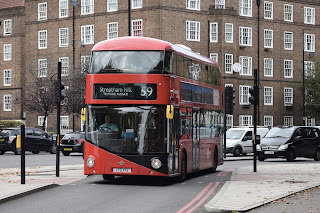 I cannot recall having taken a 59 before, so I had been intrigued to explore how it connects the southern end of Waterloo to Lambeth North in its own little section of routing which, as I write this, I have found out to be called Baylis Road. I tell you how: one stop, Lower Marsh. Then it continues to do the job it does between Euston and Waterloo: paralleling higher profile routes. Examples? Every other bus that goes between Euston and Waterloo, and in south routes like the 159, and the 133 and 333 both of which I had never paid attention to before they received MMCs. I would conclude that the 59 is an utterly boring route, but I'm objective so understand the importance of not just trying a route once before hammering down a single-sided review, especially if I feel a route's potential has not yet been acknowledged. I jumped on a 59 a few months later - LT172 from an unallocated batch, which might explain why I felt it was a better journey than my first experience. However, nothing stood out except for the approach to Streatham which was fun but can be enjoyed the same with route 159, anyway. Therefore, the 59 is near the bottom of my list of recommended LT routes. By the time route 48 was awarded to Arriva London on 25 February 2017, my academic priorities strictly moderated my focus on the bus scene. Since my return, I haven't engaged with differentiating between LT routes and their respective batch of buses as much as I used to. My criteria feels less comprehensive due to a reduced understanding of the vehicles other than their general characteristics, for example being faulty prone and having slow acceleration. My opinions from here on are really just influenced by the route itself rather than equal focus placed on the quality of the buses, too. And route 48 is not one I would highlight as completely fun. The agility of their Scania OmniCitys back with Stagecoach from Leyton (T) made for some fun rides along Lea Bridge Road and cool manoeuvres around Hackney, but route 56 was a much better alternative to that back when it too shared the same type of buses. Now that these routes both have updated allocations, such enjoyment is for the most part gone. 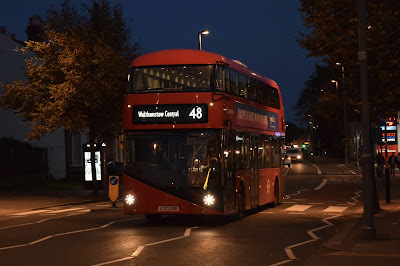 At night, the 48 can show some pace with an LT between Leyton and Walthamstow, but having to endure the route in The City and around Hoxton is off-putting. Nevertheless, the 48 is an important route for its commuters - heavily demanded right from the go at London Bridge all the way to Hackney - and its frequency is decent to accommodate this demand, although reliability is questionable. So are the DWs partly allocated to the route, but I've said enough about that type, already. Route 48 is one of the only LT converts to be second-handed with the type. The LTs allocated to route 48 are existing vehicles sourced from other services within Arriva London, primarily route 73 which received a cutback to Oxford Circus from Victoria thus a drop in PVR on 17 June 2017. Many DWs initially introduced the 48 to Arriva from Ash Grove (AE), but now the route runs almost completely with 'New Routemasters' and to be honest, I'd rather that than a 59- or 10-reg DB300. For logistical convenience, route 76 had its move from Arriva to Go-Ahead postponed from 28 January 2017 to 25 March 2017 in order to complete a more effective swap with route 259 between the two companies. Moving to an operator with no recent history of operating the route (so no existing buses blinded for the route to act as surplus) meant it was no surprise that Go-Ahead had enough LTs ready for the 76 to fully convert to 'New Routemaster' operations from the first day of the new contract. 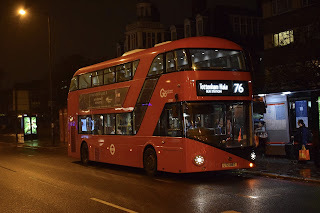 Interestingly, this is not the first time the 76 has been operated out of Northumberland Park (NP) - First London operated the route from the garage from March 1998 to February 2003, Arriva then acquiring the route from Tottenham (AR). Northumberland Park Bus Garage was sold to Go-Ahead in 2012 following the First Group's decision to leave the London bus market. A successful bid for the 76 means Go-Ahead have, therefore, reunited the route to the garage. I didn't really enjoy my first two journeys on the 76, most likely because I was still re-adjusting my focus and recovering my understanding of the bus scene and how I review buses. However, later rides were much better - most likely helped by the fact that they were in the evening. I think the 76 during peak hours is quite a busy route so not much fun can be extracted from the relatively spacious and quiet roads it serves once it leaves The City as bus stops on these roads are generally occupied. However, night journeys are so much fun as demand for the route is much lower so drivers need not stop at every stop. Albeit silly moments such as a driver mounting a kerb turning into Dalston at not the most difficult corners an LT has had to tackle, as well as sharp braking to react to traffic when trying to leave a bus stop further up the route, I have enjoyed my journeys between Old Street and Tottenham Hale. From Old Street, the route dives into Baring Street, Hoxton, from the New North Road to navigate its way through residential side roads before turning onto Kingsland High Street for Dalston. The route meets congestion again here after having left The City but soon more road becomes available as the bus embarks towards Stoke Newington and from there, that is where some pace can be unleashed to Tottenham Hale. So I think it's fair to say that I would recommend route 76 to anyone still interested in comparing LT routes. Route 254 runs from Aldgate to Holloway, Nag's Head. As for the 254, however, I have nothing to say. Retained by Arriva from Ash Grove (AE) using existing LTs from route 137 (made redundant by new Euro VI LTs), I jumped on a 254 from Stamford Hill to Aldgate. I fell asleep after a short while, waking up here and there and not really feeling like I had missed anything. Given the time, I might try out the route again because it doesn't seem like a boring one and I'm intrigued to explore just how it gets from Holloway to Aldgate, but right now the only interesting thing about this service change is in early September in Hackney whilst focusing on the 48 (and the new single-deckers on route 236), where I noted down: 'LT324 sounds off.' Perhaps reference to the dodgy engine grumble of the bus that I vaguely remember. Anyway, I haven't focused enough on the 254 to add to that and I don't think my enthusiasm for reviewing LTs is the same since my return, so I am keeping my opinion of the route and of its LTs neutral. I was invited to Imber Running Day this year, an event I had never been interested in before invitation but has an interesting backstory. Located on Salisbury Plain in Wiltshire, Imber is an uninhabited village controlled by the Ministry of Defence for the British Army. During World War II, all civilians were forced to leave the area as it was taken over for army training and, since the end of the war, Imber has remained uninhabited. However, the village opens to the public for the odd annual occasion, such as Imberbus' Running Day which has been operating the 23A bus service since 2009. Buses, mostly Routemasters and year-by-year a growing selection of 'New Routemasters' alongside a smaller addition of old single-deckers, start off at Warminster Station for a day's tour around the Wiltshire countryside and its neighbouring villages. As much as I quickly got bored by these surroundings, it was an experience which allowed me to further develop my understanding of the 'New Routemaster'. For example, while the WrightBus SRM has better acceleration, I was told the VHRs can only achieve 34mph. On the way to Imber, however, ST812 taught us that, when in hybrid mode, 'New Routemasters' allow for a top speed of 54mph before a warning appears on the dashboard to slow down. In diesel mode, I was told, 65mph had been accomplished on the previous year's trip. Still prefer a VHR, though. Or an LT on the 32. LT554 made an unprecedented appearance on route 32 on 7 August 2017. I thought a working so rare and rebellious - LTs don't stray on non-LT routes, do they? - would be an unquestionable contender for rarest working of the year. Cricklewood (W) even kept the bus out the full day! But then, another appeared a week later. Then, another the following week. Then, yet another a few days later. And then five more added themselves to the list of LT appearances on the non-LT route last month. So the working is straying towards the odd-working category, which is a shame in terms of preserving its rarity. However, with nothing official being announced, new claims are out. Will route 267 be the last to convert? Who cares, we haven't even told you about the rebranded East London Transit yet. © All rights reserved, London Bus Breh 2017. See our About Us page for photo use enquiries.